Nicole Awai, They gave me a glass of rum, and one said to me, what did I think about all this?, 2000, acrylic on canvas and painted ceramic, 52 × 140”. Courtesy of the artist and Christopher Oram. Photo by: Oren Slor. 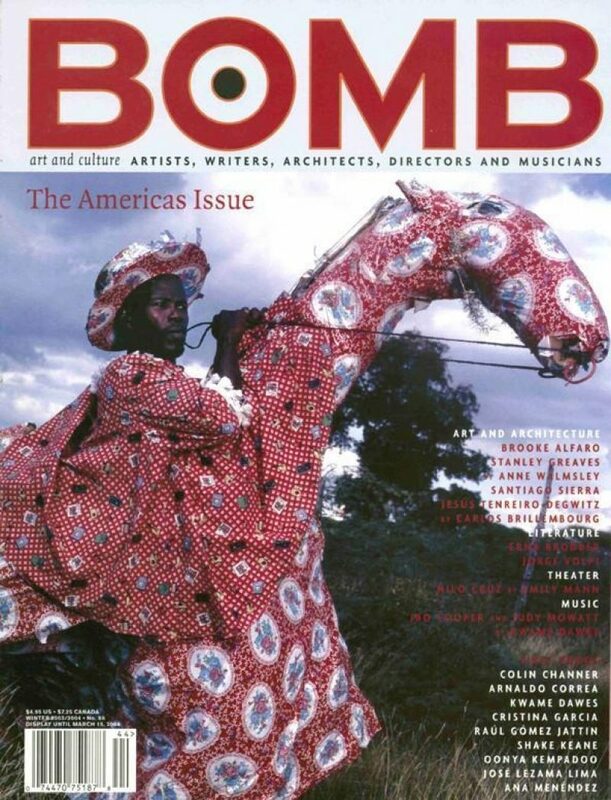 There is a generation of artists coming of age in the Caribbean who have been living in a state of “articulate silence.” These are the listeners to the oratory of the pioneering cultural producers in the post-Independence era; their responses appear in their critical perspectives and the visual language of their work. Caribbean stories and the means to understand their varied vocabularies are dispersed across the archipelago, the U.S. and Europe; new narratives are constantly being produced and expanded, and so are new approaches based on what we know and have accepted—not only on a political level but on a personal one. Nicole Awai, Identifying Desire, 2002, acrylic paint, nail polish, and make up on canvas, 24 × 24”. Courtesy of the artist. Photo by Oren Slor. Nicole Awai is a Trinidadian artist from an Afro-Chinese background who started out in Tampa and now lives in New York, and she is as connected to all that this implies as she is disconnected. Her drawings, installations, and sculptural works process a range of inferences derived from her negotiations with the persistent, mired, and myriad games of identity and labeling. In her world, a McDonald’s Happy Meal Tarzan doll, found on a Brooklyn sidewalk, shares space with the touristic Angostura bottle, that smiling, drumming Sambo-like man in a ruffled shirt. Awai relocates these characters into an idyllic landscape borrowed from the cover of an issue of the Daily Word , a publication common in middle-class Christian homes in the Caribbean. These things came her way either as signifiers of the Caribbean experience or as indicators of where she finds herself—where her head is, so to speak. Nicole Awai, Washed and Unwashed, 2000, painted ceramic, 9 1/2 × 5 x 3 1/4”. Courtesy of the artist. Photo by Oren Slor. I met Awai two years ago when I visited Triangle Arts Trust’s Big River Workshop on the northeast coast of Trinidad, a residency to which she had been invited. We went for a walk among the mounds of sand dug up the previous night by leatherback turtles laying eggs. The seafaring turtle’s seasonal return to this same beach throughout its life has special meaning for Awai, and as we talked, questions surfaced about her desire to return to the island and how and where she finds herself centered. Nicole Awai, Oozing Red White and Blue: Red Recession, 2003, 40 × 30 x 24”. Courtesy of the artist. Photo by Nicole Awai. Awai’s latest venture deals with the “ooze” of what she calls “local ephemera,” in which “history dissolves, evaporates, and reconstitutes constantly and all at once.” The ooze is a world of conflicted components and definitions in an endless process of amorphous meltdown. It is also an in between state—in Awai’s words, the “passage between perspective and periphery”—that implies an understanding of a process that is simultaneously immediate and prolonged and takes on no particular shape. One is left anticipating what more will spring forth from this potion in constant motion. Christopher Cozier is an artist based in Trinidad.